Diagnostic Link Connectors for EEC-IV processors ('84-95). '84-86 (red) located on R wheelwell near starter relay. Connect FP Relay (terminal A) to any ground (like terminal E) to force the fuel pump(s) on when the key is in RUN. Pins D & F are a primitive SCP bus, but on these old vehicles, nothing else was networked in. After warming up the engine, connect pin 1 (209 W/Pu) to any ground (like terminal E) with any jumper wire (like a paperclip) to trigger diagnostic modes. (See the NEXT diagram.) Consult the 7th post on this page for the compete procedure to pull codes & trigger all test modes. If the CEL is burned out, connect CEL (C) to a 12V test light, and the light's other terminal to a 12V source on the same vehicle. No matter what code you get, DON'T PICK THE NAME OF A PART OUT of the code definition - read the WHOLE definition, and then confirm the condition it indicates. If the condition doesn't exist, clear the code and see how long it takes to re-set that code. If the condition DOES exist, learn about the system to identify EVERY possible cause of the condition. For example: if the EVP doesn't indicate the EGR is opening, that doesn't mean to replace either of them. It could simply be a vacuum leak in one of the lines, or the reservoir. No EEC can output both 2-digit AND 3-digit codes, so if you read them that way, you're reading them wrong. Aftermarket scantools for Ford EEC-IV are notorious for delivering nonexistent codes, so don't waste your time or money on them. A jumper wire will always produce usable results. If spurious or false codes are delivered (codes whose indicated conditions DON'T exist), remove the EEC & inspect its PC board for leaking capacitors. 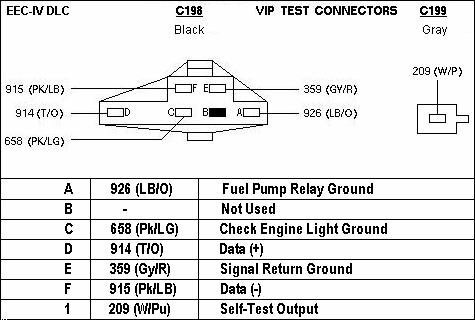 ISSUE: Occasionally, there are reports of the Malfunction Indicator Lamp (MIL) "Check Engine" Lamp (CEL) or "Service Engine Soon" (SES) lamp being lit with no Self-Test codes in Continuous Memory. An explanation of three digit EEC IV Self-Test Codes has been developed along with reasons for the MIL lamp being lit with no accompanying Continuous Memory Self-Test codes. ACTION: Refer to the following explanation of three digit EEC IV Self Test Codes to determine why the MIL lamp is sometimes lit with no accompanying Continuous Memory Self-Test codes. Ford went from two digit to three digit EEC IV Self-Test codes in 1991 to service the increasing number of service codes required to support various government On-Board Diagnostic (OBD) regulations. The phase-in from two digit to three digit codes started in the 1991 model year and is largely complete except for some medium/heavy trucks that will retain two digit codes through the 1994 model year. Following is a list of reasons why a technician may see the MIL lamp lit with no accompanying Continuous Memory Self-Test codes. There are two types of EEC Self-Tests, Key On Engine Off (KOEO) and Key On Engine Running (KOER). While both of these will test for various "hard faults" that are present when the test is run, the processor continuously monitors various operating parameters whenever the engine is running. If the processor detects a problem, it will store a "Continuous Memory" code and light the MIL. These Continuous Memory codes are put out during KOEO Self-Test after any codes associated with hard faults are output. Self-Test Codes are displayed by flashing the MIL. They are also output as voltage pulses on the Self-Test Output (STO) circuit in the Self-Test connector. In either Self-Test mode, all codes are output twice and in KOEO, the hard fault codes are separated from the Continuous Memory codes by a "separator" pulse. A technician that is unfamiliar with the EEC Self-Test can mistakenly believe that continuous Memory codes are not present when they really are. He may run KOER Self-Test and get a pass code (lll) and not realize that KOEO Self-Test must be run to receive any Continuous Memory codes. He may run KOEO Self-Test while counting MIL flashes and misinterpret the repeated hard fault pass code (lll) to mean that Continuous Memory does not contain any codes. Continuous Memory Self-Test codes are erased by ungrounding STI before KOEO Self-Test is complete and all KOEO and Continuous Memory codes have been displayed. It is possible to inadvertently erase Continuous Memory codes by ungrounding STI without realizing that KOEO Self-Test is not complete or the processor has not finished displaying all the codes. The EEC Self-Test codes are not only used by service technicians, they are used as a final system test in the assembly plants. To make this test as efficient as possible, Self-Test codes are output as a very fast, short pulsewidth signal before the codes are displayed by the flashing MIL. These "FAST" codes can only be interpreted by end-of-line equipment or code-reading testers like Ford's Self-Test Automatic Readout (STAR) testers. The EEC IV processor puts out both 2-digit and 3-digit Self-Test codes in both formats, "FAST" pulsewidth mode and "SLOW" pulsewidth mode. While all "STAR" type testers display 2-digit codes, the original STAR tester cannot display 3-digit service codes. If the STAR tester is used on 3-digit service code applications, the display will be blank but the tester will beep. The beeps can be counted to determine service codes. The SUPER STAR II tester will only display 3-digit service codes in "FAST" code mode. If slow code mode is used on 3-digit service code applications, the display will be blank but the tester will beep. The beeps can be counted to determine service codes. For more information on running Self-Test, refer to the "EEC IV Quick Test Procedures and Appendix" section of the Powertrain Control/Emissions Diagnosis Service Manual. Since certain STAR testers are capable of reading and displaying fast codes before the slow codes are finished being output on the MIL, a technician can assume that since he sees codes displayed, he can unground STI and move on. If he ungrounds STI before all slow codes are output, Continuous Memory will be erased and could put out a pass code (ll/lll) the next time KOEO Self-Test is run. The technician may also realize that his tester is in "SLOW" mode after he has initiated the KOEO test and stop the test to change tester settings. Another possibility is that another person, a vehicle owner or another technician, could have erased the codes before the technician reporting the situation has run Self-Test. In any of these situations, the vehicle must be driven until the Continuous Memory codes are reset. The EEC processor will erase a Continuous Memory code if the concern that caused it has not been present for 40 or 80 warm-up cycles, depending on the vehicle. A warm-up cycle occurs when the vehicle is started with the coolant temperature below 120� F (49� C) and then shutdown with the coolant temperature above 150� F (66� C). If a vehicle is brought in for service with a MIL complaint and the vehicle is driven or otherwise allowed to warm-up before Self-Test is run, the code may be cleared before the technician tests it. The processor controls the MIL by grounding the STO/MIL circuit (Pin 17). If this circuit shorts to ground, whether the processor is controlling it or not, the MIL will be lit. Starting in 1991, if the processor has lit the MIL, it will hold it on for a minimum of 10 seconds. If the MIL flashes quickly, the concern is probably the STO/MIL circuit shorting intermittently to ground. The EEC processor will enter Hardware Limited Operation Strategy (HLOS) if it detects a problem that could cause further damage to the system. Under HLOS, the processor modifies its operating strategy so that certain functions are disabled but the vehicle can be safely driven in for service. If the vehicle is in HLOS, Continuous Memory codes will not be set and Self-Test cannot be initiated. However, Continuous codes that were set before the processor entered HLOS will be retained. The MIL will light as a bulb check if the key is on and the engine is not running. If the engine is running and stalls or stops for any reason with the key on, the MIL will be lit and no Continuous Memory codes will be set. When the key is first turned on, the MIL will stay lit briefly after the engine is started as part of the bulb check feature. The circuit that controls the MIL is also the Self-Test Output (STO) circuit that goes to the Self-Test connector. The MIL will flash during Self-Test as the STO circuit is cycled on and off. This is normal and no Continuous codes are set. The Keep Alive Memory (KAM) within the processor must always have voltage supplied to it. This voltage is supplied by the Keep Alive Power (KAPWR) circuit (Pin 1) that connects directly to the battery. KAM contains adaptive parameter tables that allow the processor to adapt to different operating requirements. It also contains the Continuous Memory codes. Continuous Memory codes will be erased any time KAPWR is disconnected (i.e. battery disconnected, processor disconnected, breakout box installed, open in the wire, etc.). If KAM fails within the processor, all Continuous codes will also be erased. A damaged STAR tester can produce erroneous code output or accidentally erase Continuous Memory. The processor's Random Access Memory (RAM) is tested during KOEO Self-Test. If the processor's RAM has failed, the MIL will light and no codes are output. If in wiggle mode (STI grounded) and an intermittent Vehicle Speed Sensor (VSS) fault is detected, the MIL can be lit momentarily. If the VSS signal returns to normal, the associated code is erased. In normal operation, the VSS will not light the MIL. EDIS vehicles can have the MIL on with no Continuous codes if the processor does not recognize the Ignition Diagnostic Monitor (IDM) pulsewidth. In this case, coil pack failure codes may not be set since the fault filters can be erased before they reach the threshold that sets the code. Vehicles with a Cylinder Identification (CID) sensor can light the MIL with no Continuous codes present if an intermittent ignition system fault is present long enough to activate the MIL and then goes away. The CID sensor can indicate that the fault was momentary and clear the coil pack faults but the CID fault may not register if the fault goes away fast enough. If the Self-Test Input (STI) circuit opened during KOEO Self-Test or code output, Continuous Memory would be cleared. On some applications, the processor can lose power while the MIL stays powered. The MIL can light if a ground path is present through the processor. The MIL can sometimes be confused with other warning lamps like the amber Air Bag lamp if they are located near each other in the dash panel. The MIL can be lit without Continuous codes during testing or if the wrong processor is installed. ISSUE: The Malfunction Indicator Light (MIL) is a new feature that has been added to 1988 vehicles. Vehicle applications follow. The MIL (Check Engine Light/CEL) is active when the engine system requires service. An explanation of how and when the Malfunction Indicator Light (MIL) operates may need to be explained to some vehicle owners. ACTION: Use the following service information to explain the operation of the Malfunction Indicator Light (MIL) to resolve customer concerns. NOTE: IT IS NOT NECESSARY TO IMMEDIATELY TURN OFF THE ENGINE OR HAVE THE VEHICLE TOWED WHEN THE "CHECK ENGINE" (MIL) LIGHT COMES ON. The CHECK ENGINE light will come on while engine is operating in Failure Mode Effects Management (FMEM) or Hardware Limited Operation Strategy (HLOS) modes. The light will stay on as long as the fault causing it is present. In FMEM mode, the computer is receiving a sensor signal that is outside the limits set by the calibration strategy. In this mode, the computer uses an alternate strategy to maintain reasonable vehicle operation in spite of the fault. The following chart lists the system faults which will turn on the CHECK ENGINE light in this mode. The error code associated with this system fault is stored in Keep Alive Memory (KAM). If the fault is no longer present, the light will turn off and vehicle will return to normal vehicle strategy. The error code stored when the light was on was not erased. This code is one of the continuous error codes and can be accessed by running the KOEO self-test. HLOS mode is used when the system fault(s) is too extreme for the FMEM mode to handle. In HLOS mode, all software operations have stopped and the computer is running on hardware control only. The default strategy for this mode has a minimal calibration just to allow the vehicle to operate until it can be serviced. NOTE: IN HLOS MODE YOU WILL NOT GET ERROR CODES. The MIL light is turned on as a bulb check when the ignition key is first turned "ON". The EEC IV computer turns off the bulb as soon as it receives the PIP (crank) signal. If the light stays on during cranking, the computer is not receiving the PIP signal. To service a MIL concern, use the appropriate Engine/Emission Diagnosis Shop Manual. If the vehicle has no drive problems, the MIL is on, and no codes are found in memory, follow diagnostics by symptom in the Engine/Emission Diagnosis Shop Manual. The Malfunction Indicator Light (MIL) alerts the customer that 60,000 mile emission system maintained is required. To service a MIL concern on a non-EEC IV vehicle, refer to the Engine/Emission Diagnostic Shop Manual. Copyright © 1998-2019 Web Design Solutions, Inc.
All rights reserved. Duplication & reproduction is strictly prohibited.